A robin angrily pecks at the still-hardened ground as clouds above create an endless, flat gray across the sky. Spring has arrived astronomically, but it's still cool and dreary here in the Missouri suburbs. The branches are completely bare and not a single early spring flower - not a violet, daffodil or even a dandelion - has budded. In fact, the grass is barely beginning to turn green. Looking outside, you'd think that we're still in the middle of winter, yet all of that will drastically change in the coming weeks. The Vernal Equinox arrived at 11:15 am this morning, marking yet another turn of the Wheel. A holiday of fertility and growth, Ostara celebrates the scientifically-observable near-balance of night and day. This balance in the world asks us to look towards our internal balance, letting go of what is no longer needed and working towards the goals that matter most. When spring arrives, we can physically represent those goals through seeds we plant in our garden, the soil the fertile medium akin to our own lives. The value of already-owned items cannot exceed $5 and should be easily accessible. For this altar, the only non-natural item used was a small, white glass to hold the egg. The rest of the altar was entirely organic! Eggs are a sacred magical symbol representing life, goals, healing and fertility. In this case, we're speaking specifically of the fertility of the land as it warms and grows in the coming weeks. Lately, however, I've been focused on the protection of life. After attending the vigil for the Parkland victims last month and paying close attention to the continued violence since then, I wanted to create an altar that represented the purity, the fragility and the sacredness of children. In this case, the egg represents a child, a hope ready to change the world. 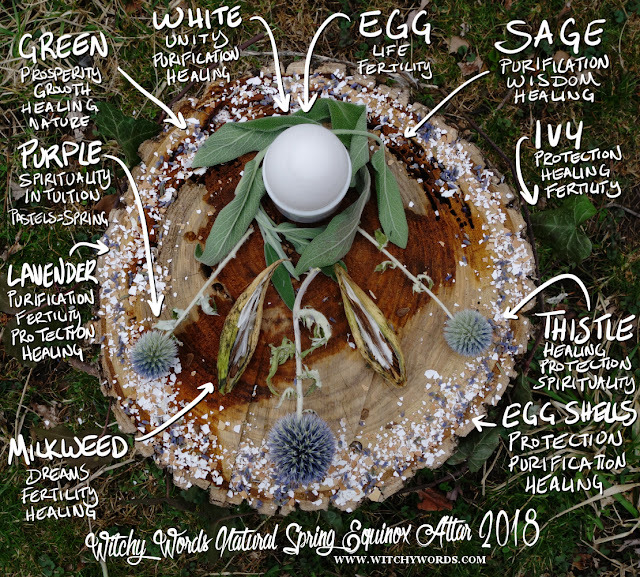 I surrounded the egg with sage, corresponding with the much-needed healing and protection of these children. In my yard, I found several milkweed pods filled with fluffy seeds ready to fly away. Milkweed is a tasty treat for butterflies and bees alike and is a welcome addition to any garden, thus its appropriate association with spring. This plant often represents healing and dreams as well. By including milkweed pods on the altar, I wanted to represent the healing of the survivor's hopes and dreams. I wanted to add something floral to the altar but, with no flowers blooming just yet, I turned towards something dried from my herbal stock: Thistle. These beautiful, pale indigo additions to the altar emphasized healing and protection. Thistle is often covered with prickly thorns, making them difficult to handle and pluck. This is an evolution that helps protect them from herbivores looking for food. The herb itself has been used historically to aid a variety of ailments. Though its effectiveness is questionable, the healing property stuck. In addition to these two, this spiky little flower also corresponds with spirituality, which I felt was appropriate given that this is an altar. 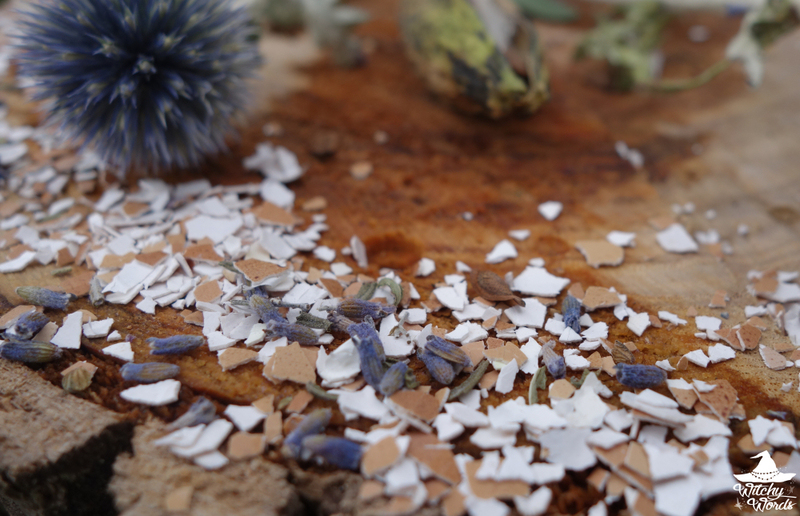 Around the edges, I sprinkled a circle of egg shells and lavender buds. Crushed egg shells are used for protection. You can either line your circle with it or create a chalk from it to draw protective sigils. Lavender is commonly used for protection and purification as well, but it also represents healing and tranquility. I wish the survivors of all horrendous acts of violence peace as they move forward in their life. All around our house, we have vines of ivy ready to crawl up towards our windows. After giving one such strand an offering of egg shells and coffee grounds, I plucked this vine to encircle the altar as the final touch. Ivy is known for its protective and healing properties. By tying the vine around the altar, I hope to encircle the victims of violence with healing and protection. Over fifteen mass shootings have occurred in the US since Parkland, many of which lacked coverage for a variety of reasons, be it a "lack" of causalities or it occurring in a minority area. I have no agenda to push; I just want everyone to be safe and secure, especially when it comes to kids. No child should ever be afraid to go to school. Whatever it means, we must remedy this situation for the sake of our future: Our children. Get out and vote. Lobby. Talk to your senators and representatives about what you believe should be done. Take action. Nothing will change if we don't change it ourselves. With that, I'll leave you a visual representation of the correspondences. Enjoy! Have a blessed and safe equinox! I really love this new series. Thank you. And thank you for creating an altar with the protection of those children and their hopes and dreams. Thank you so much, Lyn! Honestly, it's kind of nice to break the mold when it comes to altars. This fresh approach is really pushing me outside of my box!